Owl Wood Farm at Saratoga Farmers Market displaying some of their fine produce on a market day. The Saratoga Farmers Market entwines itself with other local organizations, annually offers interns, and makes its presence known at other community events through involvement. We’re excited for Saratoga to spring in as our Guest Instagram market for the next two weeks- be sure to check their snaps out! Farmers Market Coalition: Give us some history behind your market. Julia Howard: Our market has been operating since 1978. It began with a few vendors who met in a parking lot and grew to be voted one of the best farmers’ markets in the country by The American Farmland Trust. The Saratoga Farmers’ Market is run by a board of local farmers and producers and it employs 2 staff; an administrator and an assistant. Our market also has a strong volunteer organization called the Friends of the Market. And, for 3 months during our summer season, we hire 2 interns. We are a year-round market hosting approximately 70 vendors during our outdoor season (May-Oct) and approximately 40 vendors during our indoor season (Nov-April). 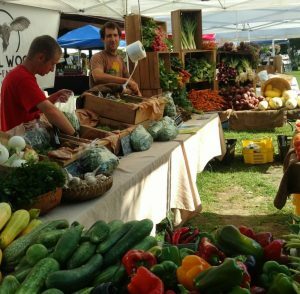 The Saratoga Farmers’ Market is a producers-only market meaning that everything sold must be made or grown by the business selling the product. We are also very proud to host local farms and producers from Saratoga and three counties that are neighbors to Saratoga, supporting true, local businesses. Our market regulates a percentage of 70% agricultural farms to 30% crafts and prepared foods. We are proud of everything sold at the market – from local peanut butter and pickles to a vast variety of produce. Our winter market has as much variety as our summer market as we have hydroponic farms and many farms that grow in high tunnels year round. FMC: Can you tell us a little bit more about the Friends of the Market volunteer organization and about the Veggie Valet and Vendor Relief programs were conceptualized? JH: The Friends of the Market set up a tent each Saturday in the same location. The tent has signage, tables and chairs, and wagons for customer use. A volunteer is stationed there to answer customer questions as well. I am proud to announce that the Friends have also just begun a composting program and a recycling program at our market. A volunteer also delivers weekly food donations from vendors to local pantries. And, they have a featured sections in the market’s e-newsletter that offers a ‘food fact’ and an interesting blog entry with a recipe. Our volunteer group is amazing. Since our market volunteers are also patrons, they recognized a need for customer assistance for those shopping at the market which led to the concept of the Veggie Valet program. Volunteers noticed customers struggling to get to their vehicles with boxes of tomatoes, large plants, and several bags in hand. It made sense for market volunteers to offer assistance to customers. When 3 large wagons were donated to the volunteer group, Veggie Valet became a reality. Vendor Relief began in a similar fashion. Market volunteers found that they were often being asked to stand in for vendors while they grabbed a cup of coffee or used the bathroom. This led to the Vendor Relief program. Now 1-2 volunteers make a point of offering vendors a break during market hours. JH: The Saratoga Farmers’ Market has two locations, based on seasons. We have the outdoor location in the heart of downtown Saratoga Springs for the months of May-Oct. The City of Saratoga built 3 long pavilions at High Rock Park and the market is a hot spot even on rainy days. The location offers the beauty of a public park with natural springs, with the convenience of local shops and eateries. In November, we move to our indoor location in the beautiful Saratoga Spa State Park. This location is also convenient to the downtown, yet the Saratoga Spa State Park is a beautiful and quiet setting with miles of hiking trails, natural springs, and historic buildings. The indoor market is located in a historic bathhouse. JH: Our market accepts nutritional assistance programs. One may purchase market tokens with their SNAP card and we are running the FreshConnect Program year-round. Most of our farms participate in the Farmers’ Market Nutrition Program and accept FMNP Seniors and FMNP WIC. Our farms also participate in the WIC program. The Saratoga Farmers’ Market has a close and active relationship with the community. We host live music at every market, we have activities for children at every market (hosted by local organizations), and we hold a monthly event in which we collaborate with local restaurants, non-profits, local programs, and businesses. JH: Our market is very active on Facebook, Instagram, and Twitter (although Twitter is not very effective for us). We promote events on every local site possible – from local sites for family activities to the Chamber of Commerce events calendar. We are sure to take advantage of every free website where someone may Google, ‘what’s happening in Saratoga Springs?’. We select advertising very carefully by choosing a few powerful publications where we will be noticed and not overlooked. We are listed in the events section of all area newspapers. We participate in many annual ‘Best of’ competitions. And, we are reverting back to passing out flyers and speaking at schools. The most powerful promotion is putting a face and a purpose to our market. Whether it is a random donation to a food pantry or judging an elementary school pie contest, actions and involvement speak the loudest in our community. We also network with local colleges. FMC: What makes your market special? JH: The spirit of our market makes it truly special. People come because it is a community event. They support local businesses and our local businesses support them. It is a strong, beautiful network of people coming together. JH: We recently rebounded from a time where vendor morale was very low. This was remedied by hiring a market administrator to communicate for the board so as to avoid a conflict of interest while supporting the market’s rules and regulations. Now we host a very positive and upbeat market. We are also evolving to stay current with the times. This includes on-line advertising and picking up our social media presence. Writing for grants and shifting our market to a 501(c)6 is a consistent challenge for us, but we are making progress. Our market also struggles to appeal to a young audience – but this is changing! Farmers Market Coalition: When vendor morale was low, how were these issues voiced and worked out? And how did the solution of hiring a market administrator arise? JH: In the past, issues and concerns were mediated and addressed by a market manager – who was also a vendor. This presented a conflict of interest, and in some cases more of a problem. At times, issues were not voiced or worked out which impacted vendor relations and set a negative tone at the market. Even though the market’s board is made up of market vendors, there also seemed to be a gap between board members and market members. The Saratoga Farmers’ Market modeled the market administrator position of the farmers’ market in Troy, NY. The market administrator position has created a bridge between the board members and market members. The market administrator works with market members and answers to the market’s board and there is open communication and a more unified market environment. The market administrator is also empowered to mediate and handle any problem or concerns that arise in a fair and unbiased way. Vendors have trust and confidence in the market administrator which has made the market environment positive and free of gossip and drama. Farmers Market Coalition: What seems effective for attracting and appealing to the younger audience? JH: I’ve begun more outreach at one of our local colleges and that audience responses when I explain the market as a weekly festival with live music and all types of local artisans and prepared food. 18-25 year olds are also interested in workshops hosted by vendors. Our mushroom man, occasionally hosts ‘mushroom growing 101’ which are 1hr information sessions that have been very popular. We also had a very successful first season of POP Club for kids that brings back familiar faces each week.